Queerness and clowning collide in a beautifully funny remix of Shakespeare's most iconic tragedy. 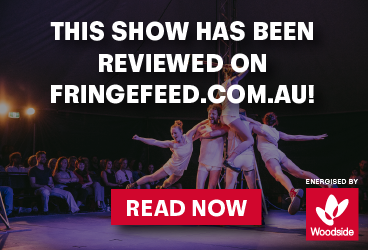 After sensational sold out seasons at Midsumma Festival and Melbourne Fringe, theatre mischief makers Kimberley Twiner and Lily Fish bring you Not Romeo and Juliet; Shakespeare, plus stupid. Set in a pathetic circus, ringmaster Veronique aspires to the grand spectacle of a bygone era while her long-suffering assistant stumbles upon then falls in love with poetic, Shakespearean text. As the romance of the bard's words possess them, against all the rules, these charming idiots cast themselves as Romeo and Juliet. Not Romeo and Juliet is high-octane theatrical anarchy, ridiculous physical comedy and a joyous celebration of queer love.